A semi-biographical western, The Life And Times Of Judge Roy Bean takes a relatively lighthearted look at a legendary character. Gambler and outlaw Roy Bean (Paul Newman) arrives in lawless Texas territory west of the Pecos River. Roughed up at an isolated whorehouse, he is helped by Mexican girl Maria Elena (Victoria Principal) and single handedly disposes of his aggressors. Reverend LaSalle (Anthony Perkins) is passing through the area and helps bury the bodies. Finding a thick textbook of Texas law, Bean installs himself as the local judge. 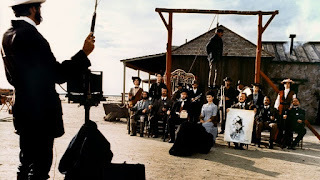 He converts a group of outlaws including Tector Crites (Ned Beatty) into his team of Marshalls, and runs the local saloon as his own courthouse. Bean is obsessed with celebrated east-coast singer Lillie Langtry (Ava Gardner), adorning his walls with her images and following her news through the New York Times. Gradually a community grows around the rough law-and-order halo provided by Bean. 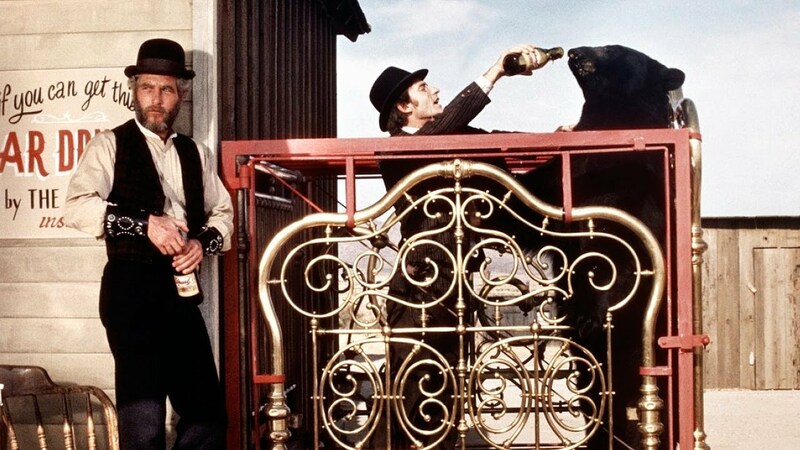 Over the years Bean and Maria Elena adopt a bear, and he grapples with crazed outlaw Bad Bob (Stacy Keach) and conniving lawyer Frank Gass (Roddy McDowall). Very loosely based on the antics of the real character (who also featured in such films as The Westerner from 1940), The Life And Times Of Judge Roy Bean is amiable but never quite gets its tone right. 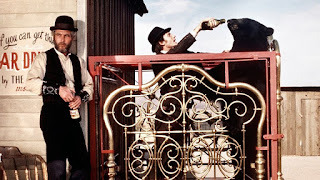 Director John Huston steers star Paul Newman towards fluffy Butch Cassidy And The Sundance Kid territory, complete with a silly romantic musical interlude featuring a frolic with Maria Elena and a pet bear as the prop instead of the bicycle. The problem is that the John Milius script wants to be somewhere else entirely. According to this screenplay, the only thing notable about Roy Bean is his crusty and caustic character, a self-appointed lawman quick to shoot outlaws in the back and hang others without a second thought. The smooth, suave and charming Newman struggles badly with crusty and caustic, saying the words but unable to overcome his instinctive charm. Despite the fundamental piece of miscasting, Huston manages to construct a decently enjoyable western. The film is episodic, which in this case helps. Bean's obsession with Langtry and his low-key relationship with Maria Elena are the only constants. Other events and characters come and go in a series of vignettes, some drawn from history and others clearly inflated by legend or totally made up. Huston never dwells for too long in any one place, and the two hours pass swiftly. The opening sequence is a highlight, with Bean barely surviving a lynching and coming back with a vengeance to clean out the vermin. Later Huston injects sharp humour with a depressed drunk who is allowed to shoot-up the place until he takes aim at the wrong target and suffers the consequences. The film also carries the requisite look. The setting is remote, dusty and even as a community grows around Bean's courthouse, Huston maintains a desolate frontier aesthetic. Judge Roy Bean may have created his own version of civilization, but it was always rough between the edges.